Healthcare executives constantly grapple with issues concerning the safety of their facility, the satisfaction of their staff, the quality of care provided to their patients and the costly workflow inefficiencies that impact their bottom line. Oftentimes, information technology (IT) innovation for healthcare is cited as a potential vehicle for improvement. Innovators are constantly working to create technology that can both promote patient safety and support streamlined business operations. What is one of the newest and most effective ways of addressing these challenges? Integrating Real-Time Location Systems (RTLS) into hospital processes. In healthcare, a Real-Time Location System (RTLS) is a system used to provide immediate or real-time tracking and management of medical equipment, staff and patients within all types of patient care environments. While the technology differs from using location data captured by satellite trilateration, it can be thought of as a type of “indoor GPS” for hospitals. However, more so than just locating assets, accurate locating technology that easily integrates with other Healthcare IT solutions enables facilities to improve workflow, reduce costs and increase clinical quality. RTLS solutions comprise various tags and badges, technology platforms (Wi-Fi, Infrared, Bluetooth Low Energy, Low Frequency, ultrasound and others), hardware infrastructure (readers & exciters) and other components (servers, middleware & end-user software). RTLS solutions typically include location sensors that are attached to various assets be it a patient, a staff member or a piece of equipment. Utilizing a unique ID, the system can locate the tags and give you real-time information about its positioning within the facility. Estimation-based RTLS solutions can enable tracking in a hospital’s unit or floor, whereas Clinical-Grade Locating™ systems are able to achieve room, bed, bay and even shelf-level tracking for true workflow automation. An example of a hospital error that could have been prevented using RTLS solutions occurred at a hospital in Pasadena, California, in which 11 patients died due to infections from mismanaged duodenoscopes. They were not cleaned properly, and hospitals have to take a critical look at the reprocessing and storage of their duodenoscopes to prevent future infections. CenTrak’s Medical Scope Management Solution using a Clinical-Grade Real-Time Location System (RTLS) can automatically track and create alerts through every stage of this cleaning process. Staff immediately know when medical scopes need to be cleaned and are instantaneously notified of any possible infection risks. The ability to create contact tracing reports based on knowing when and which staff members and patients have come into contact with an infected person or asset. The ability for nurses and staff to call for help quickly in the event of an emergency or physical threat. The ability to detect when certain machines or systems are either part of an active recall or due for cleaning or maintenance. The ability to create alerts letting staff and nurses know if a patient has wandered into an area where they aren’t supposed to be. This is particularly crucial when caring for patients with dementia or Alzheimer’s. The ability to protect infants from abduction attempts as well as improper mother/baby matching using alerts and security system/door lock integrations. "The activating principle for this system integration is ‘measuring and managing the patient journey’ where the entire patient experience can proceed in an efficient and clinically effective manner." RTLS technology can be particularly helpful not just for patient safety, but also for experience and satisfaction. Patient satisfaction has become increasingly more important since the Affordable Care Act tied Medicare reimbursements to patient satisfaction surveys. As of 2012, hospitals who did not do well on the surveys were at risk of losing 1% of the previous year’s payouts; since 2017, that risk is 2%. Overcrowding in outpatient clinics, emergency rooms and post-anesthesia care units. Not having enough beds for patients. The fact of the matter is that hospital patients are in a near-constant state of motion. Between X-rays, moving around for rehabilitation purposes or switching between perioperative milestones, there is a lot of room for unnecessary delays or error. Departments that can operate more efficiently with real-time location information will be the ones to keep patients less stressed during their stay. CenTrak is proud to be a provider of accurate, reliable Enterprise Locating and Sensing Services™ for healthcare facilities all around the world. Below is a list of our most recent awards. We are pleased to be recognized by some of the top healthcare and technology organizations. Integrating RTLS technology into hospitals can help cut down on unnecessary expenditures. One review, published in the International Journal of Health Geographics, projected that hospitals buy 10% to 20% more portable equipment than is needed for operational purposes, simply so that staff can find it when they need it. Some items, perhaps most notably an ICU ventilator, come at a very high premium. Purchasing the optimal amount based on utilization and having hospital RTLS keeping track of these machines can help reduce the number of asset redundancies. This can cut down on costs as well as save time for your clinicians when equipment is always where it should be. Locating at entry or exit points: Using CenTrak battery-operated devices, you can determine the course of different tags as they move through entry or exit points. Presence-based locating: At this level, RTLS can determine whether or not a tag is within a certain parameter — normally a fairly wide net. Room-level locating: You can find out whether or not a tag is within the confines of a certain room. For example, in the event that a nurse must call for emergency assistance, RTLS can tell security personnel the exact room where the nurse is located. Sub-room level locating: Using RTLS you can tell exactly how much time a nurse spent in a room with a particular patient, or you can determine the location of a piece of equipment within that room. This is especially useful when you have rooms that are shared by multiple patients. 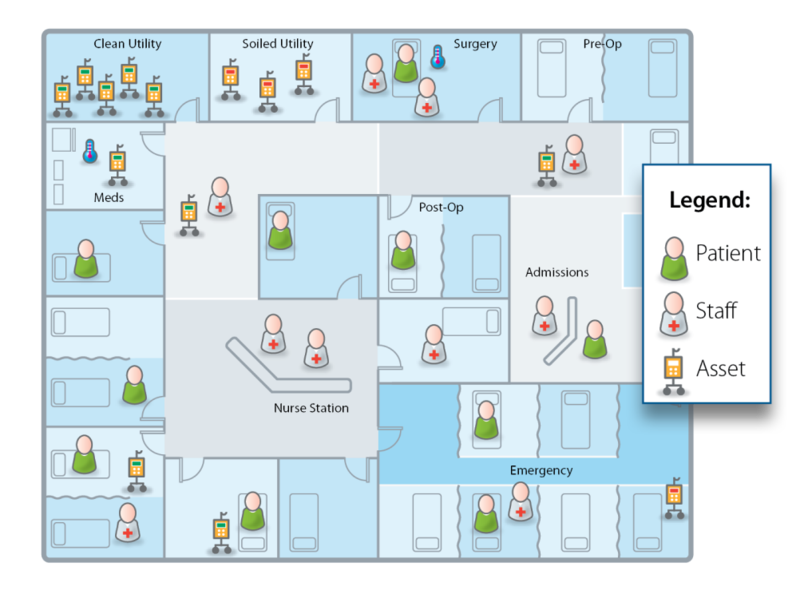 Precise locating: In the hospital context, precise locating can find the exact tag location pinpointed on a detailed floorplan. Rapid location and condition updates are capable of accurately capturing interactions between equipment, patients and staff within seconds, facilitating the collection of clinical milestones and automating workflow. Staffing shortages in hospital systems are becoming increasingly pronounced. For example, the 2015 Survey of Registered Nurses by AMN Healthcare revealed the fact that 62% of nurses older than 54 report they are considering retirement with the majority planning to do so within the next three years. Beyond nursing, the shortage problem persists across other essential hospital physicians, including operating room doctors, members of the neonatal department and the intensive care unit. Healthcare facilities have little choice but to address these shortages head-on by optimizing current resources while continuing to provide quality care. Operating room — Automating events and documentation like tracking case status, milestones, patient location and department work queues can provide quick insights into the department. This reduces stress while improving efficiency. Surgical departments can also use RTLS to lower the amount of time dedicated to finding assets, which greatly optimizes staff utilization. Intensive Care Unit (ICU) — Finding equipment and assets as quickly as possible in the ICU can quite literally be the difference between life and death. Staff members under pressure may not have enough time to locate needed assets. RTLS solutions, like those offered by CenTrak, have the ability to pinpoint the exact location of needed resources with 100% accuracy. When clinicians can perform their jobs without being interrupted by misplaced equipment challenges, they enjoy a more seamless workflow. This can come with the bonus effect of increased job satisfaction. 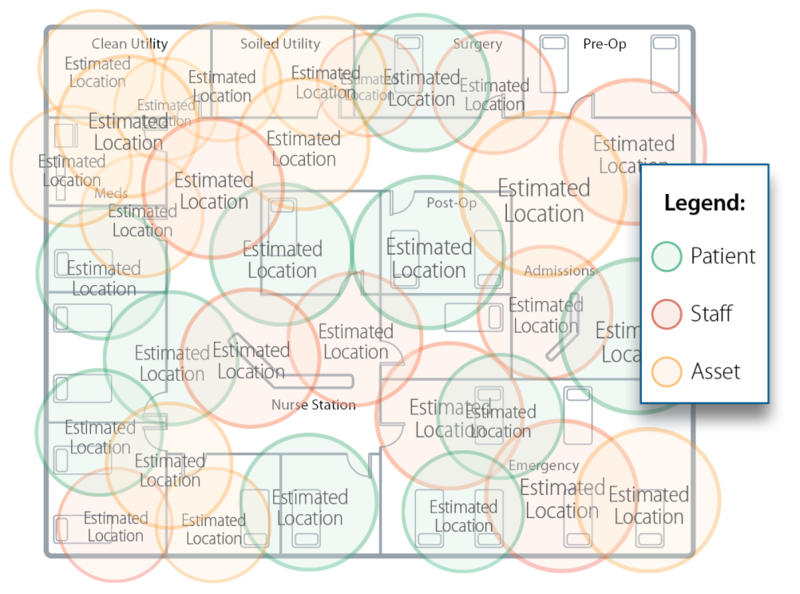 Location accuracy — Most RTLS systems breakdown the facility by estimated zones to locate assets. However, the ability to define the clinical area based on the healthcare facility’s specific requirements is one thing that makes a visibility system more accurate. Knowing the supplies are on a particular floor or unit as opposed to knowing which room or even which shelf they are on is an important point of accuracy. The capacity of segmenting space into appropriate zones is how CenTrak provides accurate location visibility. Zones such as nursing stations, beds, patient rooms, bays and hallways are clinically significant, and therefore, most useful for medical applications. Update Speed — An accurate location is only useful if it is delivered in time. Items and people can move quickly in a hospital, which is why CenTrak’s platform updates accordingly. For certain pieces of equipment, update speed might not matter since they do not move often. In this case, update rates are customizable to optimize tag battery life. CenTrak makes it possible to capture equipment, patient and staff interactions by delivering condition and location updates rapidly. Within seconds clinical milestones are collected. Reliability —Low batteries and hardware failures can disrupt the flow of work and operations for the entire facility. CenTrak delivers critical condition, location and status updates to your chosen software application. Complete visibility is possible at-a-glance due to enterprise-level devices and tags equipped with long-lasting batteries. With CenTrak’s Connect™ Pulse, healthcare facilities are notified when batteries are running low to ensure proper maintenance and prevent lost assets. Condition Monitoring — Supplies that require strict temperature or humidity control need extra attention in storage and during transportation. Collecting environmental conditions data on these items is critical to ensuring they are still safe and viable when used. In addition to location, this vital information needs to be recorded and available to the appropriate personnel to aid with compliance regulations. With automated environmental monitoring and pharmacy temperature monitoring, CenTrak keeps critical pharmaceuticals, blood, lab samples and vaccines safe and ready for patient use and maintains records on their storage temperature and conditions. Installation —Systems that require extensive hardwiring are costly and time-consuming to install. Meanwhile, battery-powered devices are installed easily in patient care areas without the need to close rooms or deploy special infection prevention measures. CenTrak’s wireless infrastructure has resilient batteries that are easy to change in the field, providing enterprise-class monitoring and visibility to healthcare facilities. Interoperability — Integrating with other systems is a big benefit to a location technology platform. Healthcare facilities are full of independent systems operating in specific departments or across the entire facility. The best RTLS systems work with existing hardware and software making it easier to parse together all of the data needed to make decisions. CenTrak integrates easily with over 130 healthcare applications including Nurse Call, Electronic Medical Records, Computerized Maintenance Management, and other security and access control systems your facility may already have in place, such as card access, video surveillance, public address systems and pagers. Is the vendor financially stable? Most RTLS systems are a long-term commitment. They require purchasing hardware and training to be sure to maximize capabilities. It is a good idea to purchase from a vendor who will be in business for a long time, updating and servicing the infrastructure along the way. What are the key objectives? Ascertain clear medical and business objectives for implementing an RTLS system. The only way to find the right system and assess its success is to know what outcomes are desired. Different goals will necessitate various system capabilities. What are the long-term goals? Be prepared to phase in a complete system by prioritizing goals. Accommodate the immediate needs first but use components that can be scalable to reach long-term goals. What is the compatibility with existing systems in the facility? Staff won’t want to wear multiple badges or have to keep track of which interface provides access to what data. Layering technical systems within the building when they have overlapping functions is not practical. The new system you choose should either replace or integrate with existing technology. What is the latest technology? Just like in the medical field, technology is changing constantly with regard to locating systems. A full-scale visibility solution that covers the whole facility and performs multiple tasks will take time to implement. If it is based on aging technology, the system will be obsolete by the time the phase in is completed. Choose an innovative company that can adapt quickly to the technology landscape. What does it cost? There is a wide range of pricing structures on RTLS systems. For example, CenTrak’s RTLS system does not need to be hard-wired for installation, like many other systems on the market. Having to hard-wire a system during installation can drive costs up significantly due to the amount of time and work it takes to integrate the system properly. 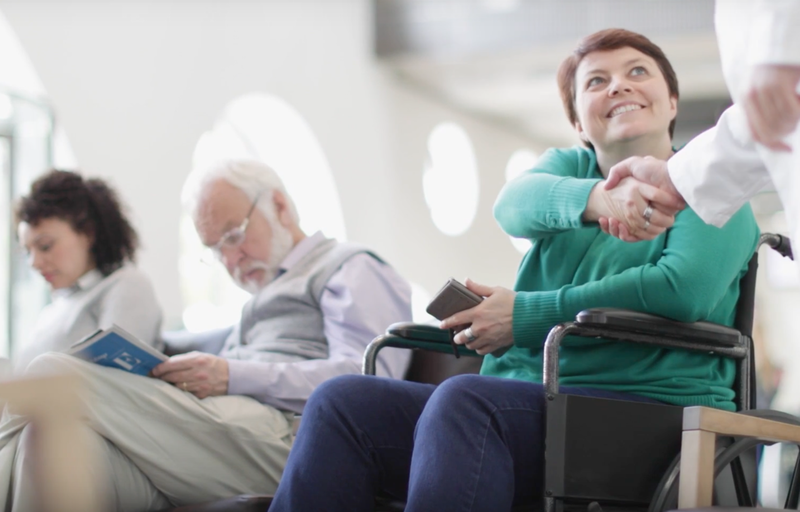 Just as GPS has impacted travel, RTLS is changing the way healthcare facilities operate. With a smarter RTLS installed, any healthcare facility can operate more efficiently for better patient outcomes and a stronger financial future. Getting the right system with the necessary capabilities, involving all factions in the decision-making process and planning a phased roll-out are all keys to successful RTLS implementation. For more guidance on selecting an RTLS provider, download a free RTLS RFP template. Develop a committee within your healthcare facility that will help manage the process of implementing the RTLS technology. Many departments will play a role in managing as well as enjoying some of the benefits of the system once it is deployed, so it is important to have buy-in from all stakeholders. As this group becomes an expert with the system, they will be able to use their knowledge to evaluate new RTLS opportunities and maximize the facility’s investment. Agree upon specifications. Ensure that there is a common understanding and definition of various accuracy levels (room-, bed-, bay-, chair-level) and update latency requirements. Also make certain that all battery life expectations are clearly documented with detailed assumptions related to the activity-level for each tag and infrastructure update speeds. Next, create a formal planning and assessment process that is unique to your facility. Having a formal process in place helps to prioritize the most valuable applications as well as minimize any unexpected interruptions down the road. Align the activity and goals of the RTLS with the principles of your facility. By categorizing your goals and initiatives with the system, it becomes easier to assess system effectiveness and identify improvement opportunities. Focus on integration and scalability. Examine the capabilities of the technologies currently owned and expose gaps that may require the acquisition of niche RTLS application functionality. Project the number of tags in future states and ensure that the recommended architecture will be capable of supporting the targeted use cases well into the future. Thoroughly explain the importance of the system to patients, staff, and their family members. It is easy for involved parties to feel as though their privacy is being compromised if they do not fully understand the value of the system first. Taking the time to answer questions and explain the value of the technology will help ensure buy-in from all involved. Test small roll-outs in one or two departments before rolling out the system on a facility-wide scale. This will help ensure that any hiccups are alleviated quickly and do not impact the entire facility. CenTrak’s Multi-Mode RTLS Technology sets itself apart by employing a combination of Second Generation infrared locating (Gen2IR™), Wi-Fi, Low Frequency RF, UHF Active RFID, Bluetooth Low Energy (BLE), Advanced Ultrasound (IRUS™) and others to future-proof investment and maximize ROI. The battery-operated infrastructure components (such as monitors or Virtual Walls™) are able to give you a unique location number and pinpoint any tagged assets in the room or zone that your healthcare facility has defined. They can be placed anywhere they are needed, including rooms, bays, nursing stations, hallway segments and other relevant workflow areas without the need for costly hardwiring. The technology also has the ability to leverage your own Wi-Fi network to communicate location and condition information to authorized hospital personnel. Open Platform – CenTrak’s open platform enables location data to be streamed in real-time to over 130 integrated partner applications. The platform also supports the use of location data from Wi-Fi clients including computers on wheels, IV pumps and phones. Ultimate Accuracy & Flexibility – CenTrak’s battery operated devices can be positioned wherever accurate location data is needed including rooms, hallways, bays and even chairs. Therefore, when a tag reads a room number, there are no errors. This is certainty-based RTLS, a requirement for today’s healthcare automation and workflow applications. CenTrak’s BLE beacons were designed for wayfinding applications. CenTrak’s BLE functionality is one of the many locating technologies supported by our Enterprise Location ServicesTM, offering a future-proof investment. When your healthcare facility is ready for more advanced workflow applications, CenTrak’s battery-operated Real-Time Location System (RTLS) infrastructure may be added in strategic, mission-critical areas. Rather than just system specifications, it is important and beneficial for you to focus on the achievable and demonstrable real-world benefits associated with RTLS technology, such as cost reductions and optimized efficiency as well as increased staff and patient satisfaction. CenTrak is committed to helping you achieve these benefits by building a smarter, more streamlined health system. CenTrak’s RTLS Technology is certainty-based and error proof. It’s tracking you can trust. Want to learn more about CenTrak’s Real Time Location Services?